Boogie Monsters slot machine from Microgaming is a 5-reel mobile slot with a somewhat strange dancing monsters theme. The game has 40 paylines, a good maximum jackpot of 2,500x per line bet, and two bonus rounds, one of which is a free spins bonus that awards players up to 13 free spins and there is a multiplier up to 5x. The full Boogie Monsters slot review is below, and there is some free cash for you to play with as well. If you’ve ever wondered what the cast of Michael Jackson’s Thriller video did with their days off, Microgaming slots’ Boogie Monsters slot that is certainly capable of providing one possible answer. A five-reel, 40-payline title, the Boogie Monsters slot machine explores the seemingly incompatible subjects of demonology and disco in a fun-filled video slot that’s bursting with bizarre characters. Featuring all manner of gyrating ghouls and moonwalking mummies on its reels, the game provides a visually-striking user experience that also benefits from the inclusion of free spins and a fun bonus round. Playable from as little as £0.40 per spin across all desktop, mobile and tablet devices, Boogie Monsters offers a maximum jackpot award of 2,500x players’ line bet, but a 5x multiplier in the game’s main feature means there’s potentially even more at stake for the patient video slot player. 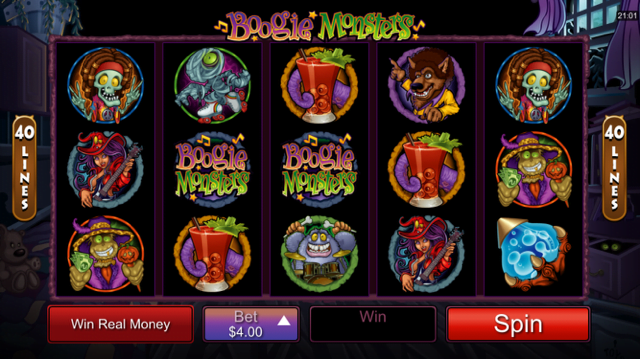 While the Boogie Monsters slot is strangely lacking in substitute wild symbols, there are a couple of handy bonus features that can potentially boost players’ base game winnings. The first of these is known as the Fat Bat bonus and is triggered whenever three or more bat icons appear anywhere on the reels. When this happens, players will be transported to a new screen where they’ll have to shine a torch to reveal three of the 12 monsters hiding in the shadows. Each pick will result in a random prize being awarded, with a maximum payout of 24,000 coins or 60x your triggering bet up for grabs here. The slot’s main attraction, however, is the free spins feature that is triggered whenever three or more Lava Lamp scatter symbols feature on the gameboard. This will instantly award players with 13 free spins, during which all payouts will be subject to an impressive 5x multiplier. Naturally this can create some pretty impressive wins, but unfortunately this feature cannot be re-triggered again. A fairly enjoyable game for all horror movie fans, the Boogie Monsters slot provides a light-hearted take on the genre that makes up for its general lack of wilds courtesy of two highly rewarding bonus features. Like the Boogie Monsters slot review? Check out these as well…..